Posted: February 9th, 2012 under ApSIC Xbench. We’re happy to announce that we have just published a new set of spell-checking dictionaries for 33 languages. This new release includes several fixes and enhancements, and you are now able to create one or more addendums per dictionary. 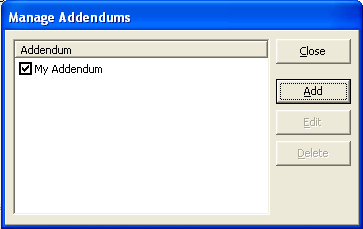 To check out the new addendum feature, just choose Addendum->Manage Addendums from the main spell-checking window to create an addendum. As the previous release, it is also based on Hunspell dictionaries. To install the spell-checking plug-in, simply extract the contents of the language’s .zip file into ApSIC Xbench’s installation directory (typically, C:\Program Files\ApSIC\Xbench). 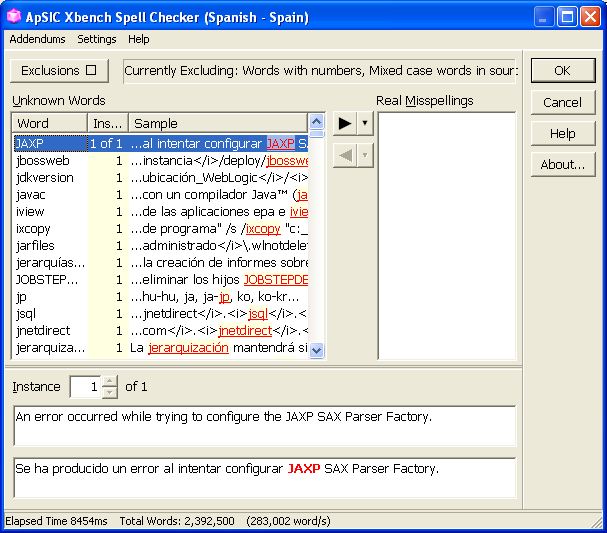 Once you have copied the files, you will notice that next time you start ApSIC Xbench, an additional entry named Spellcheck appears in the Check Group box. Each misspelling variant is listed only once and the Instances column indicates how many actual segments are affected by the listed misspelling. Using this window, you will indicate which items are real misspellings by double-clicking them to move them to the Real Misspellings list box on the right. Once you have reviewed the list of potential errors, click OK to close the window. Segments with misspellings will be listed among the rest of QA results and you will be able to use the Edit Source feature to get right to the offending segment. Also interesting are Exclusions, which can be useful for some type of texts prone to false alarms. You have the ability to change the working mode by choosing Settings->Change Working Mode to indicate false alarms instead of real misspellings (which working mode will require fewer clicks will depend on the type of text you are spell-checking). As usual, please do not hesitate to contact us with your feedback using our Web Form.